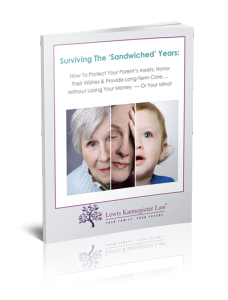 Surviving the Sandwiched Years - Lewis Kannegieter Law, Ltd. Surviving The ‘Sandwiched’ Years: How To Protect Your Parent’s Assets, Honor Their Wishes & Provide Long-Term Care….Without Losing Your Money—Or Your Mind! When caring for kids and aging parents, planning ahead is critical to ensure mom or dad gets the help they need without losing everything they have worked so hard for or placing your own financial security (and sanity!) on the line. I have created this e-book to give you a head start in navigating the complicated world of long-term care. My goal is to steer you clear of the common mistakes and traps that bring families to my office who are financially maxed out, faced with limited options and at the mercy of the courts for permission to manage their parent’s affairs and retain control. How to avoid common mistakes that can jeopardize Medicaid eligibility or expose adult children to liability for their parent’s long-term care costs. Legal and financial strategies to shield your parent’s assets and money from nursing homes or the state. Why your parents’ estate plan may not work if it has not been updated in past 5 years. How adding your name to a parent’s bank account or home can backfire causing serious penalties and exposure to lawsuits and creditors. 3 documents you need to manage mom or dad’s affairs, access medical records and maintain control in the event of sickness or incapacity. Key medical, financial and legal information you would never think to grab that will save you a ton of time, money and headaches in a medical crisis. How to give your parents the gift of aging without worry or struggle! Remember, sickness, memory loss or incapacity from a stroke or other condition can happen without warning. Don’t wait to get a rock-solid plan in place to protect your parents and make your job as a caregiver as easy as possible. Download your e-book absolutely free now by filling out the form below.